Your prom is one of the most exciting nights of your life, and it’s likely your prom pictures will be across all your friends’ Facebook profiles as well as taking pride of place in your parents’ living room, so you want to make sure you pick the perfect prom dress for you. We’ve put together the ultimate guide to choosing your prom dress so you look and feel your absolute best on prom night. Read on to find out how to find the prom dress of your dreams. You might feel like your prom is an absolute age away but it will come around before you know it – trust us! Make sure you allow plenty of time when it comes to picking your prom dress. Don’t just think you can nip to the shops the week before – this will backfire! If you leave it to the last minute, you run the risk of not finding anything you like, styles being sold out or falling for the perfect dress but not being able to get it in your size in time for your prom. You also need to allow time once you’ve found your dress to find the right accessories, makeup look and hairstyle – so much is influenced by your choice of dress so you need plenty of time to factor it all in! Also, if you’re looking to the high street for your prom dress, it makes sense to buy it a couple of months in advance as it decreases the likelihood of one of your classmates going for the same dress as shop stock changes so quickly. If you’re buying a prom dress from a formalwear shop, you need to allow time for it to be ordered in and for any alterations you may need. Don’t give yourself any less than six weeks for this. Whilst we totally endorse building the perfect Pinterest board for inspiration and collecting your fave fashion magazines to browse through for ideas, try not to be too focused on trends. Whilst one-shouldered, ruffled gowns might look cool on the catwalk right now, make sure you think about what suits you and what you’ll still love to look back on in ten years’ or so. Think about the pictures you’ve seen of your parents when they were teenagers – you don’t want your prom pictures to look dated, so by choosing a classic prom dress that suits your style your pictures will be timeless. Whether you’re paying for your own prom dress or if it’s a gift from your parents or another family member, make sure you have a clear idea of budget limitations before you start looking. There’s no point browsing super-expensive shops and falling in love with a pricey prom dress when you have a limited budget and will just end up disappointed. Find out what your budget is before you set off shopping and then only allow yourself to look at gowns that fall within that price range to save yourself from any dress-devastation. If your best friend has her heart set on something floor-length and black, think carefully about what you will choose. If you love matching with your bestie then shop away together and find outfits that complement each other perfectly. However if you want to stand out in your friendship group and have your own look, make sure you know what styles your friends are going for to avoid any awkward clashes. 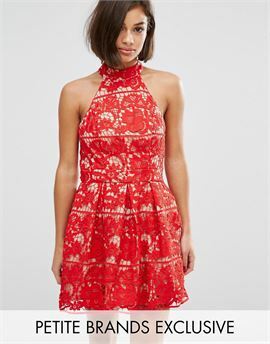 You might be totally obsessed with a Bardot-neckline prom dress with lots of gorgeous lace detail, but step outside your comfort zone and try on a few other styles too – you might surprise yourself with what you end up falling for. It’s not often you shop for prom-style dresses so it’s unlikely you’ll have seen yourself in a variety of prom-worthy dresses before. Make the most of it! Make sure you take someone who you trust shopping with you, whether that’s your best friend, your mum or an older sister. Whoever you choose as your shopping buddy, make sure you know they’ll be honest with you (in a nice way!) and let you know what works for you and what doesn’t. You want to look your best at your prom and the people closest to you will know more than anyone what suits you and what doesn’t. If you know you hate wearing your hair up and want to have it loose and flowing for your prom, think about this when choosing your dress. A prom dress with a fussy, detailed neckline won’t work with loose hair. If you have accessories in mind already, it’s a good idea to take them with you when you go shopping, and to style your hair in a similar way to how you want it at your prom – then when you’re trying dresses on you can see how it looks with your potential hairstyle and accessories to get a better idea of the finished look. What goes under the dress is just as important as what goes with it! Will you need a strapless bra, some stick-on cups or a thong? Is the dress supportive enough to forgo a bra? And will you be comfortable wearing (or not wearing!) that kind of underwear? Factor this in before you commit to your gown. What About Your Prom Date? If you have a prom date (lucky you!) make sure you factor in what he or she is wearing to prom as well – you want to look subtly coordinated. Too much coordination and you might look a bit Britney and Justin in 2001 (Google it, trust us). Think about the style of outfit and colour they are going for and plan ahead to see how to can discreetly reflect each other’s look. Cute! Still on the hunt for the perfect prom dress? Make sure you check out our edit of prom dresses to flatter every figure.